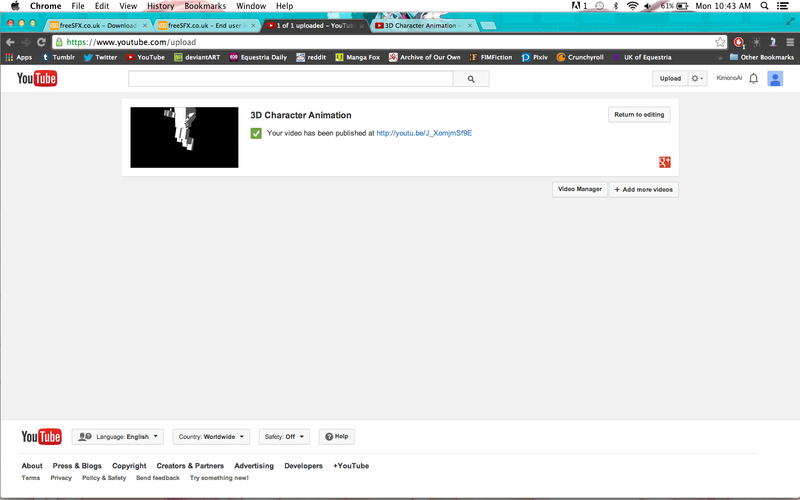 For our final major project we were tasked with creating an animation of at least two minutes in length. I went for a 2D animation using ToonBoom Harmony for the animating, Adobe Photoshop for the backgrounds and Final Cut Pro for editing the scenes together. I decided to go for a 2D animation instead of a 3D animation as my skill set is more firmly rooted in 2D style artwork and animating and wanted to create something relevant to my skills and what I want to do in the future with my degree. My animation, titled ‘Joyful Journey’, follows a character, whose appearance is based on me, walking and appearing in various different worlds, most of which are recognizable places to most people who enjoy video games, cartoons and comic books. The animation follows my personal animation style which is quite cartoon-y and stylized, rather than sticking to the styles that each scene would initially be in. This was a decision I took upon myself as a designer/filmmaker. I wanted this animation to show people what I could do with my own artistic style of animating and drawing rather than that I can copy other people’s existing work completely. I was more comfortable using the generic worlds as a background to my own animating talents. I feel that the animation was better for it. The animation colour style was inspired by popular animations on television at the current time, such as Adventure Time and Steven Universe. These shows have a basic colour palette with flat colours and no shading. Since these cartoons are so popular at the moment I wanted my colours to reflect that. Before I had decided what I wanted to do for my final idea as a whole I had a couple of other ideas. I had initially, before the year had started and so before the brief had been handed out, wanted to animate a music video to a person’s song on YouTube. Afterwards I had several other ideas that could have been animated before I decided on my final animation concept. The reasons these ideas were dropped to begin with varied from finding it difficult to script to being not interesting enough to take up a two minute animation. 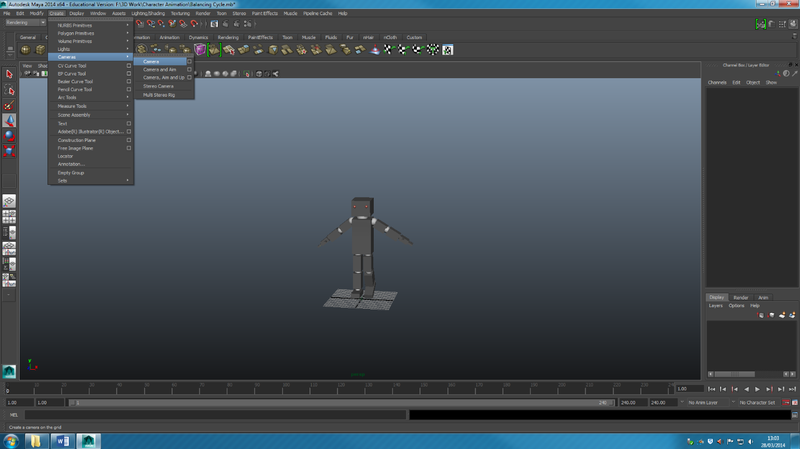 I do have plans to continue theses animations after university has finished as I feel they would both keep my skill level up and would look good and offer a nice variety to both my portfolio and show reel. My animation for my final major project went through a wide variety of changes, between its first concept to its final design. I had originally conceived an idea of a character whose design was based upon myself walking through a variety of different video game worlds. I had planned to have the character change artistic styles to match the world the character was in. 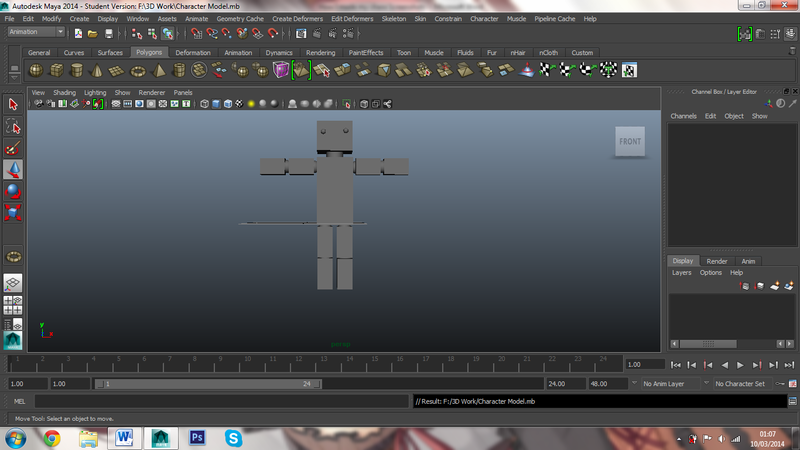 I scrapped that idea as I wanted my animation to reflect more my style of animating and not someone else’s. 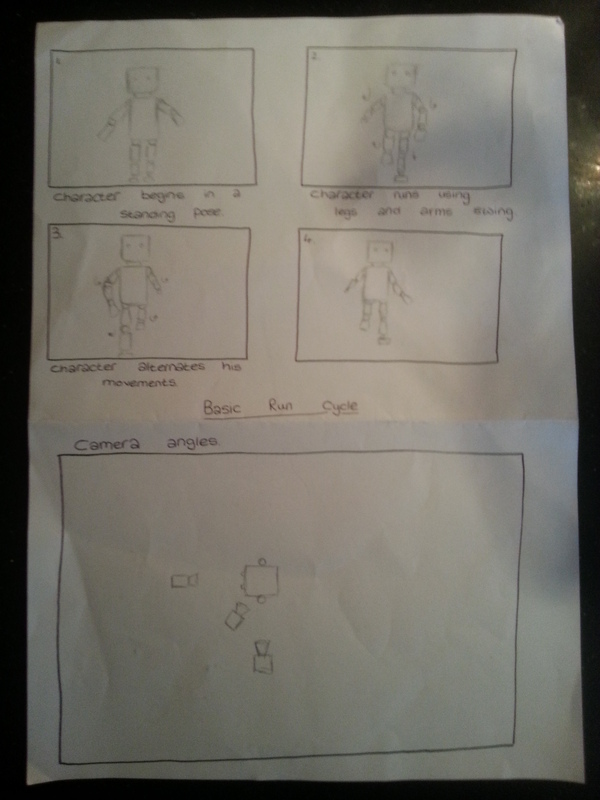 The second draft of my animation was similar to the first, but also featured scenes from television shows, movies and cartoons. During the design phase I stopped doing this version as my original intention for my animation was a channel introduction for a gaming channel on YouTube so I felt like the scenes that weren’t from video games wouldn’t fit with the theme I was going for. My third concept had only video game themed scenes in the animation, and had moments where the screen would freeze and say something about the YouTube channel such as advertising that the channel would do streaming, or that there would be ‘Let’s Plays’ and reviews. 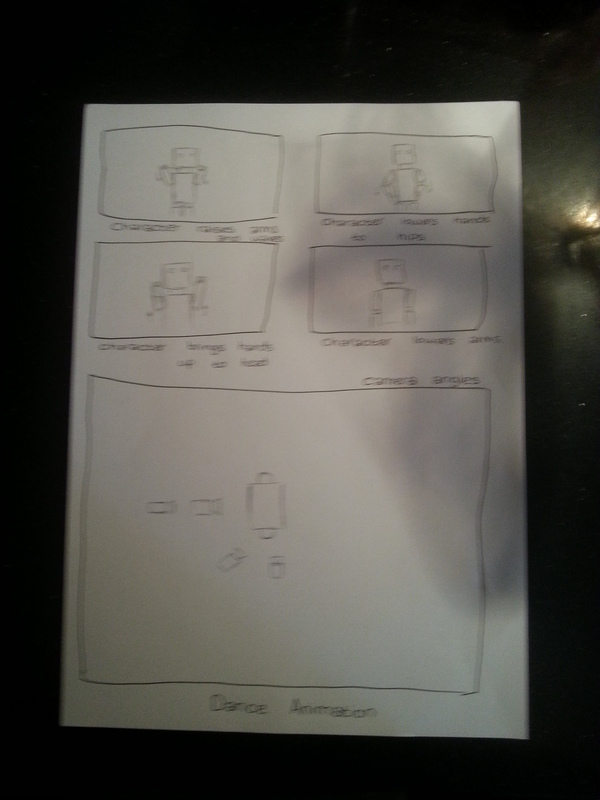 This idea was also scrapped when I realised I wanted to create an animation that wasn’t advertising a channel on YouTube. My final animation used some ideas I had initially scraped but brought back the more I thought about what the final animation would look like. I stopped wanting to do the animation as an introduction for a YouTube channel and just wanted to create an animation with scenes that I wanted to animate. 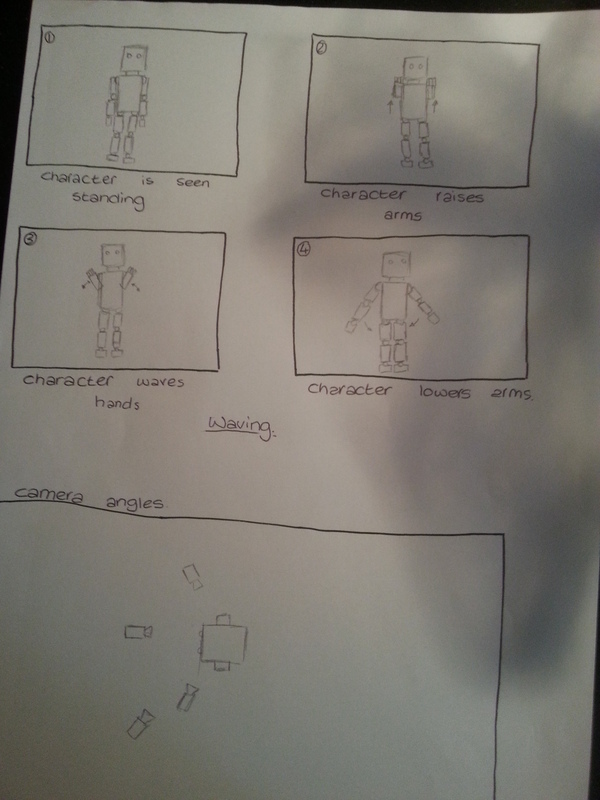 I wanted to have the various scenes from more than just video games, and included some of the scenes from my second draft of my animation and also included some scenes that I felt I would enjoy animating as well. Unfortunately the changes I made to my animation came quite far into the animation process when I found that certain scenes just wouldn’t work when I was attempting to animate them. The reasons for dropping scenes from my final animation ranged from the scene being outside my skill range to the scene just not looking how I’d planned. As such some of the scenes had to come together quite rapidly so I could keep to the deadline. I feel that if I was given the option to animate this animation again from scratch I would have a solid plan with which to draw upon and I could get my animation done to an even higher skill level. I also feel the animation would be longer had I more time to spend on it as I could of either gathered more entirely new ideas for it or could of used some of the scenes in older drafts of the animation. I could of even used the scenes I had to drop as if I had of had more time I could of got my skill level with ToonBoom Harmony up and been able to animate scenes that were too difficult for me to do at my current skill level. The sound I used in my animation was from a website that allows people to download and use the music free. I decided to do this as I am not at all adept at making my own music, my talents lie in animating and illustrating, and wouldn’t know how to even attempt making something to the level other people can. I chose a song after much deliberation that I felt would encompass the sort of feeling I wanted to get across. Since the animation has a ‘happy-go-lucky’ and cartoonish feel to it I had to make certain that the sound track I used matched the animation as flawlessly as possible. 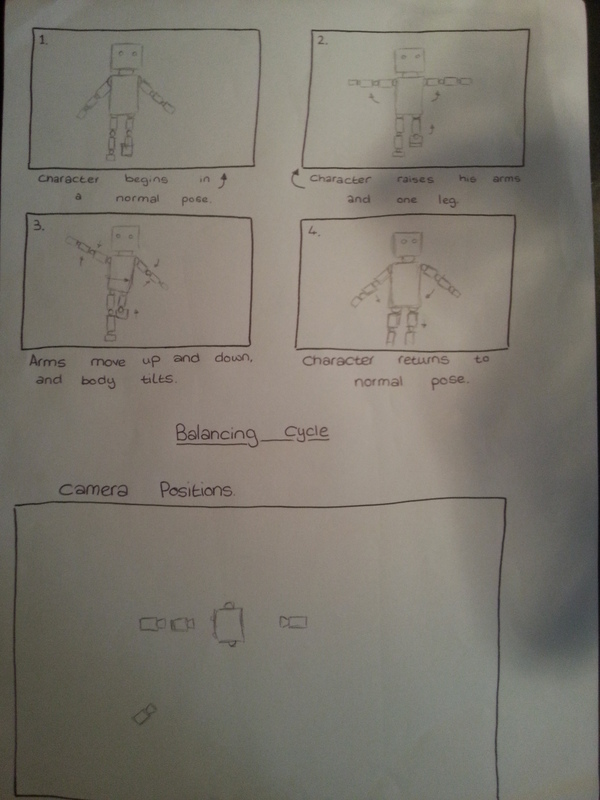 I feel that in the end my animation was done to the highest skill level I am capable of as of the time of writing. I do feel that if I had of been given either more time or went for an even more basic animation style and story that I could of accomplished a longer animation, but as it stands I am happy with it. 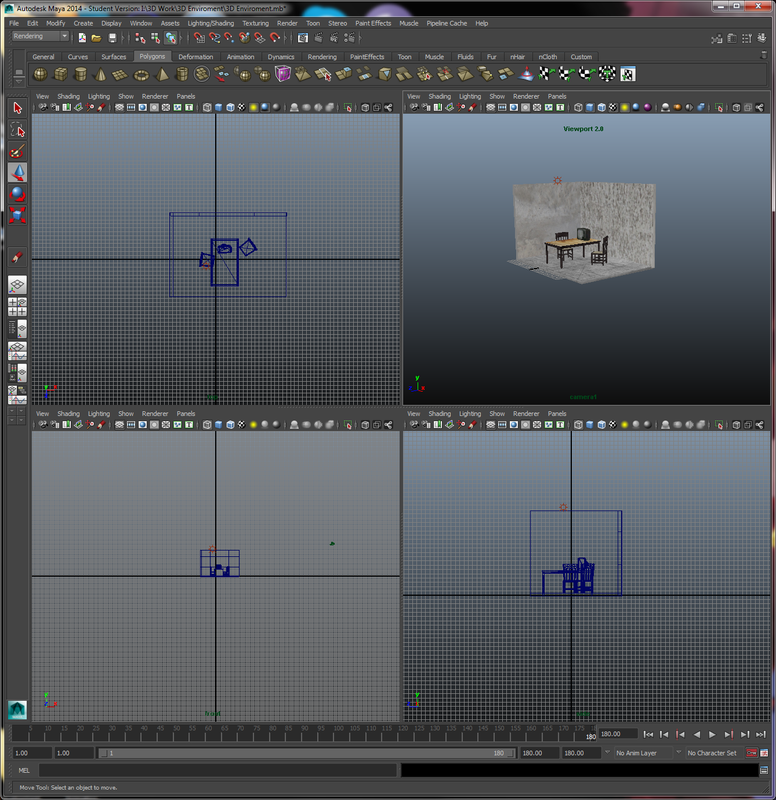 The skills I acquired whilst doing this animation is something that I will take with me into the workplace, and are skills I can continue to build upon after university has finished. This animation might be one I come back to at a later date, when my skills are a lot more polished, and might be something I update then. 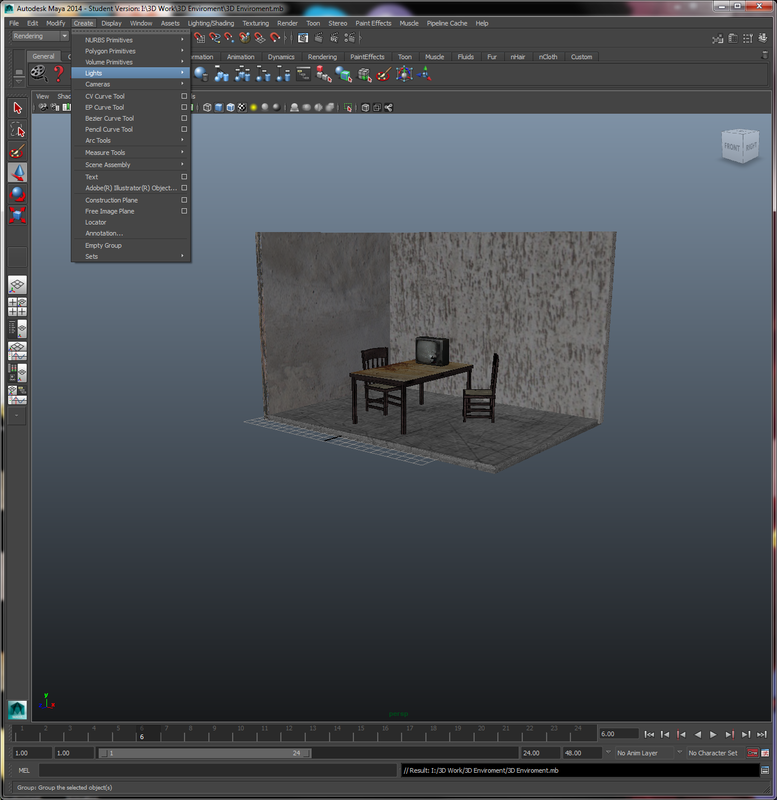 I decided I wanted to create a post-apocalyptic room for my 3D environment. 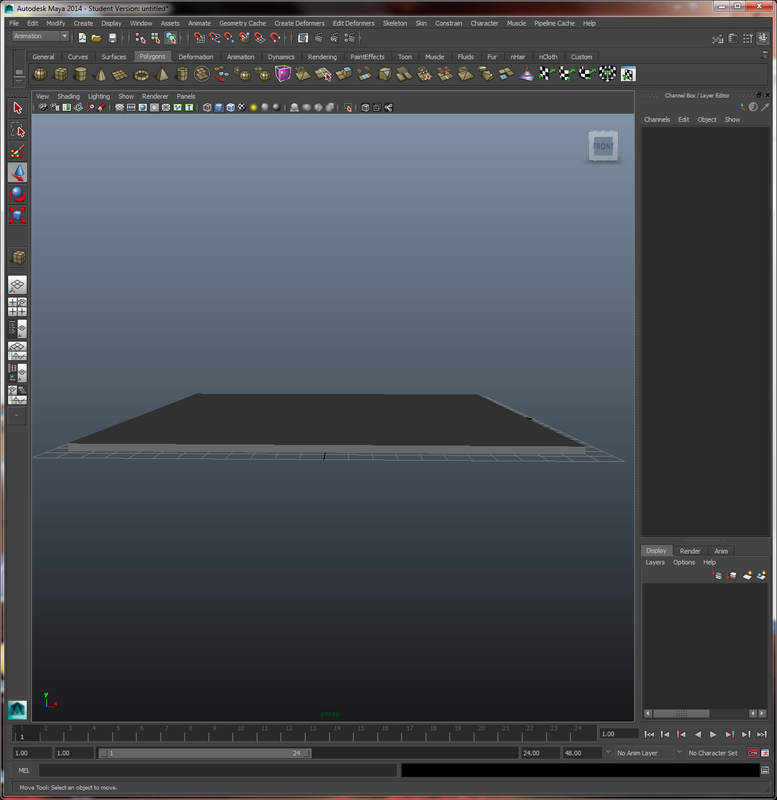 Step One: To begin with I created a floor. 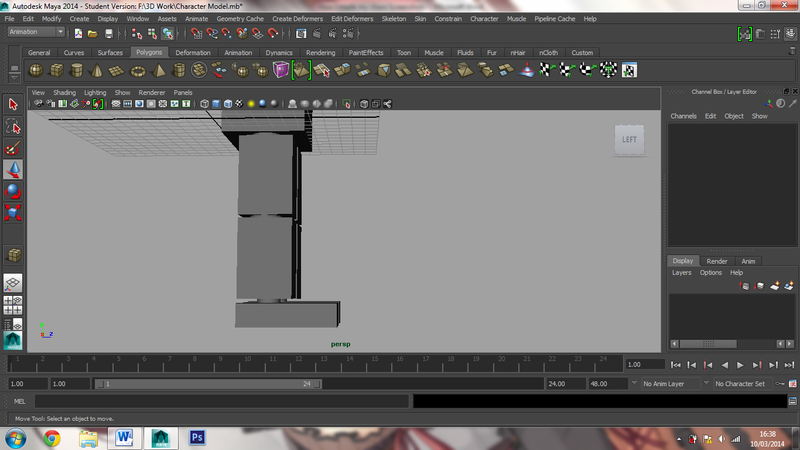 Step Two: I then created two walls and changed them so they fit the floor. 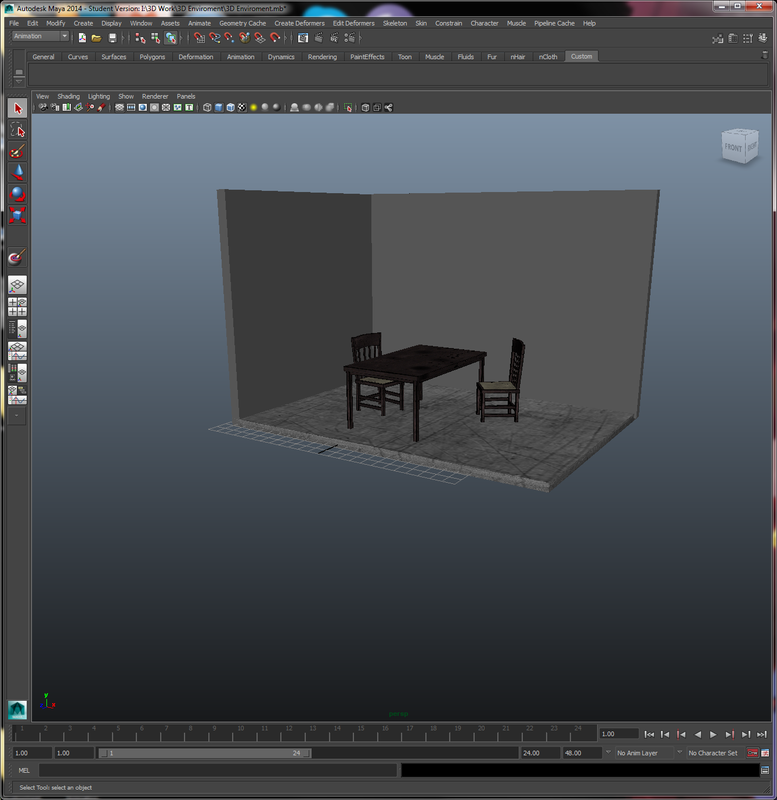 Step Three: Using a website, I found the components I needed for my interrogation room. 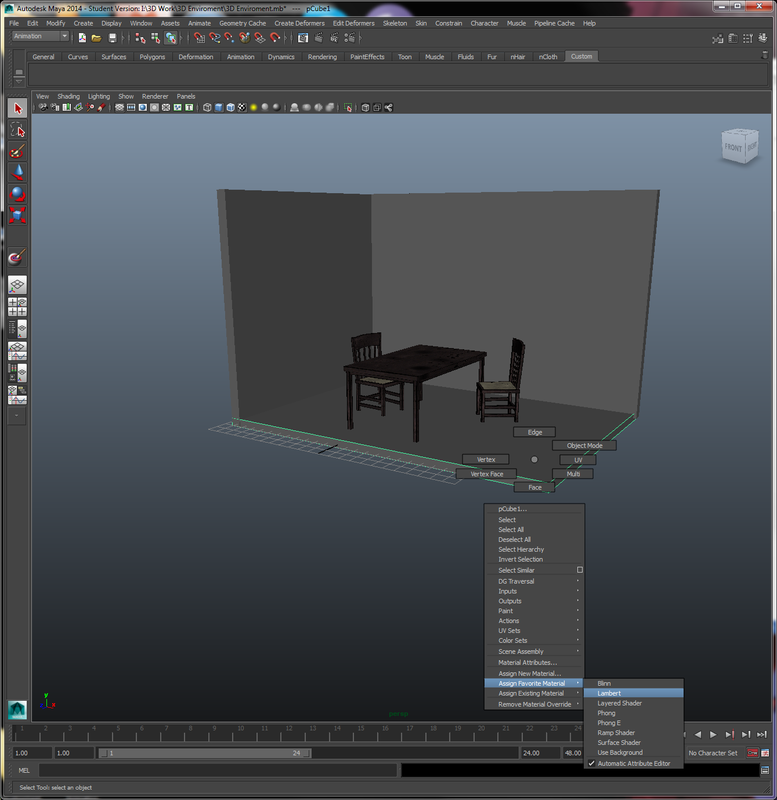 Step Four: Once they finished downloading I started to import the pieces. Step Five: I then edited the pieces to be the right size. 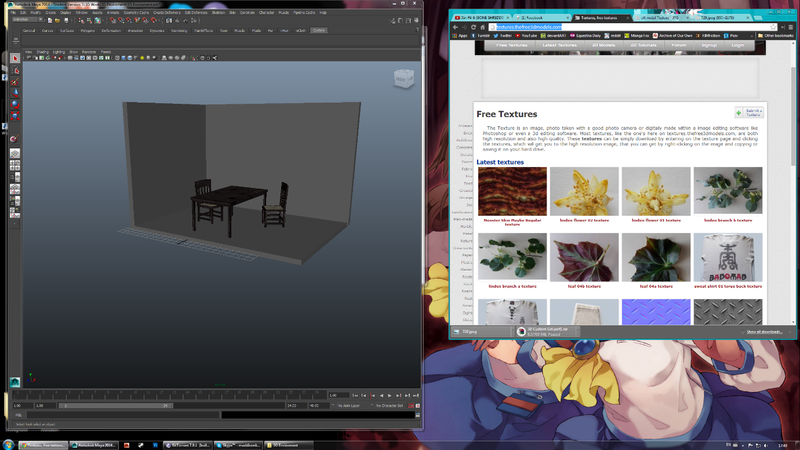 Step Six: I then proceeded to find some textures to apply to my environment. 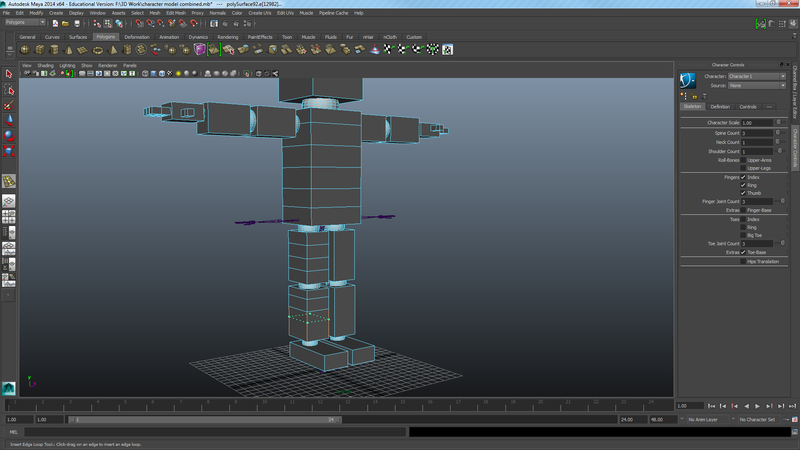 Step Seven: I then started to apply the textures. I clicked on assign favourite material as lambert. Step Eight: I then pressed the chequered box by colour. 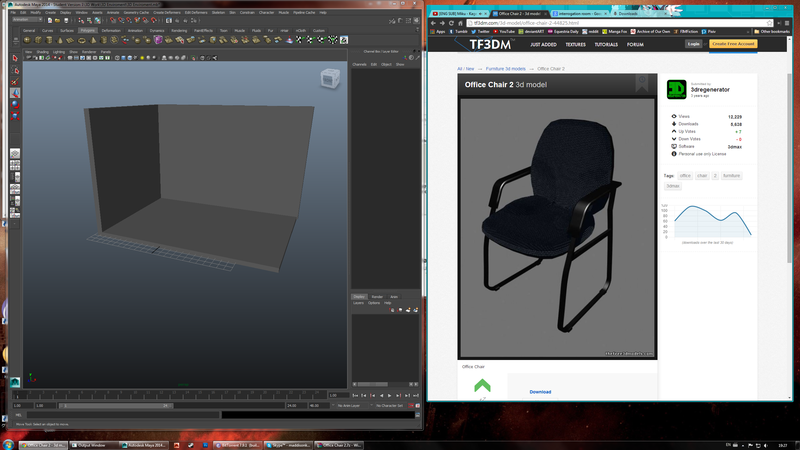 Step Nine: I then pressed on the File option and chose the texture I wanted. Step Ten: The floor then looked like this. 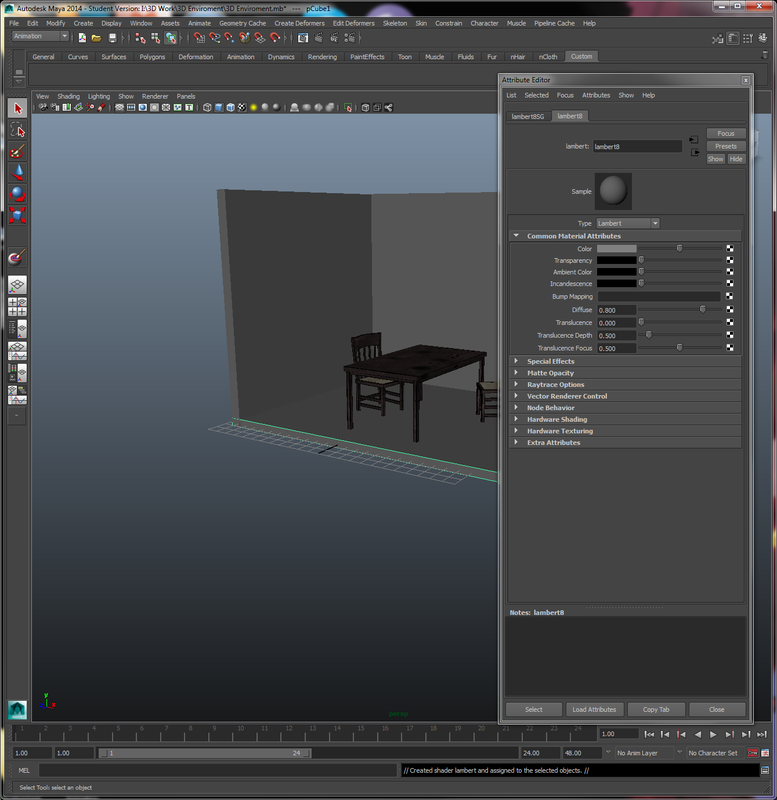 Step Eleven: Once I had the various items in the room and the room textured, I then started on the lighting. I created a light to begin with. Step Twelve: I then manoeuvred the lights into different spots to achieve this look. 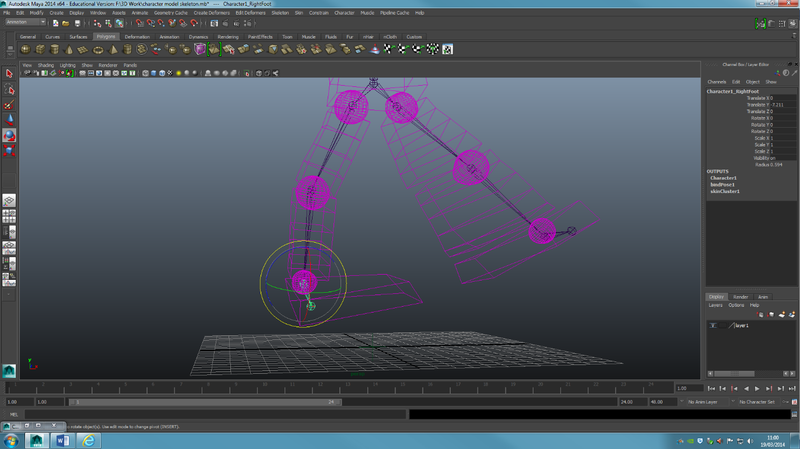 Step Thirteen: I then began the camera movements. I used the timeline to move the camera around. 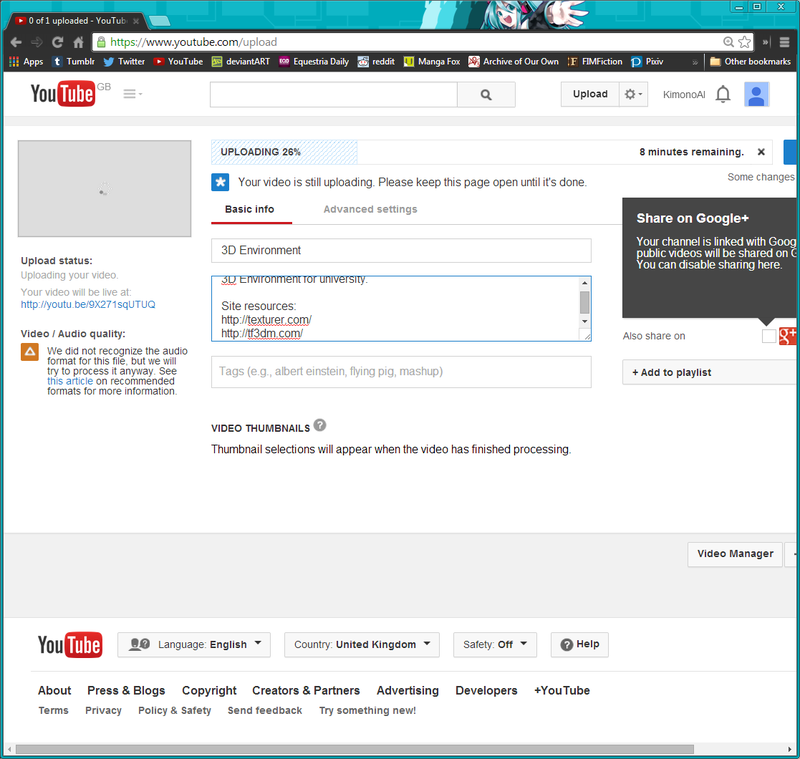 Final Step: After rendering it I uploaded it to Youtube. Step One: To start animating I first got my character into a suitable pose. 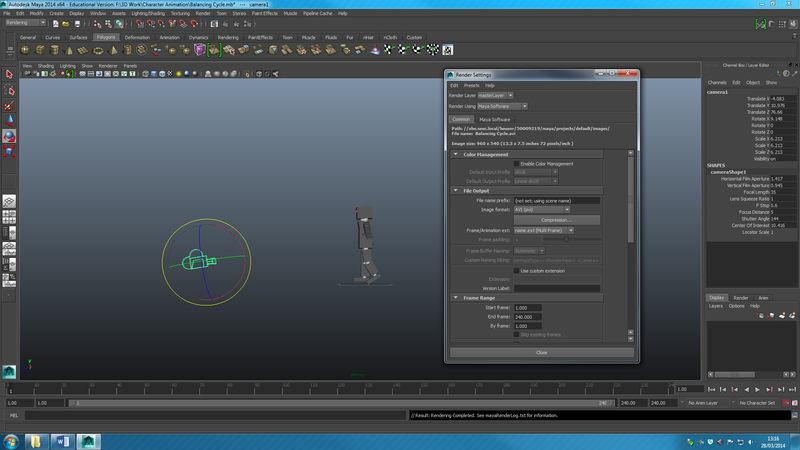 Step Two: I used the ‘S’ key to create key frames if I needed them but I used the auto keyframe tool. 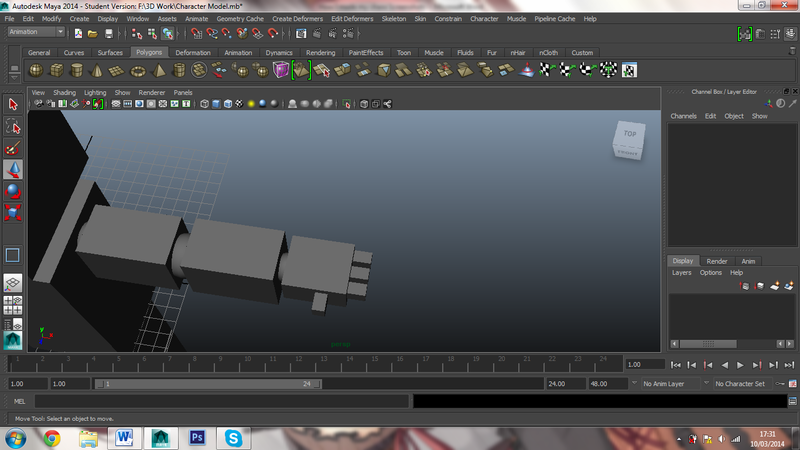 I then proceeded to animate the parts of my model. 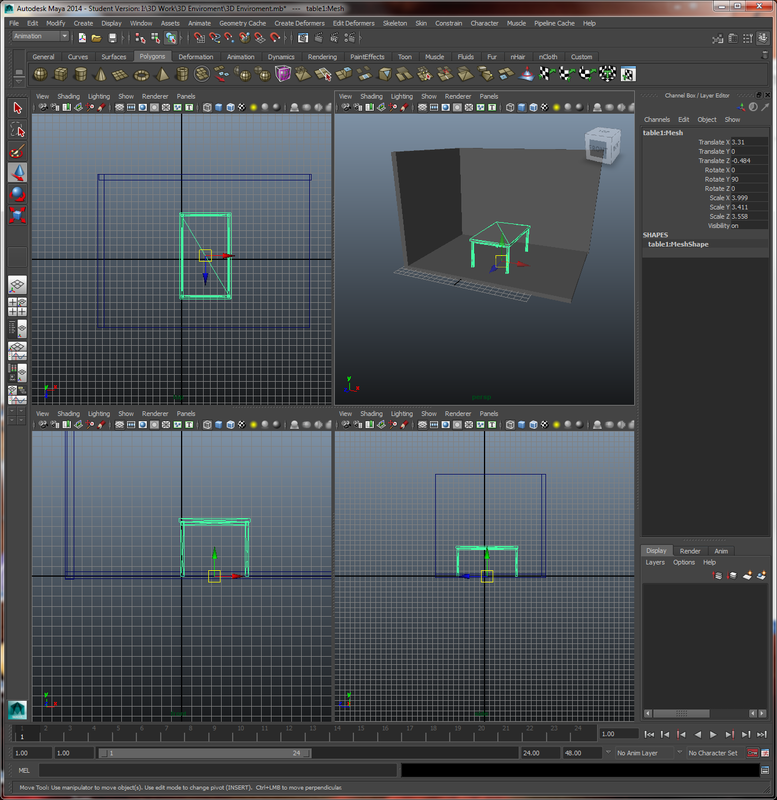 Step Three: Using the auto keyframing I was able to move my model and have the keyframes insert whenever I move my model. 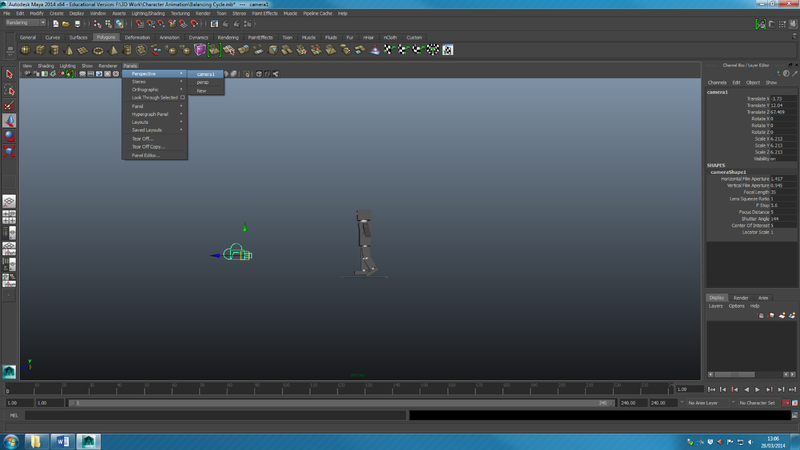 Step Four: Once I finished animating the character I put cameras in. 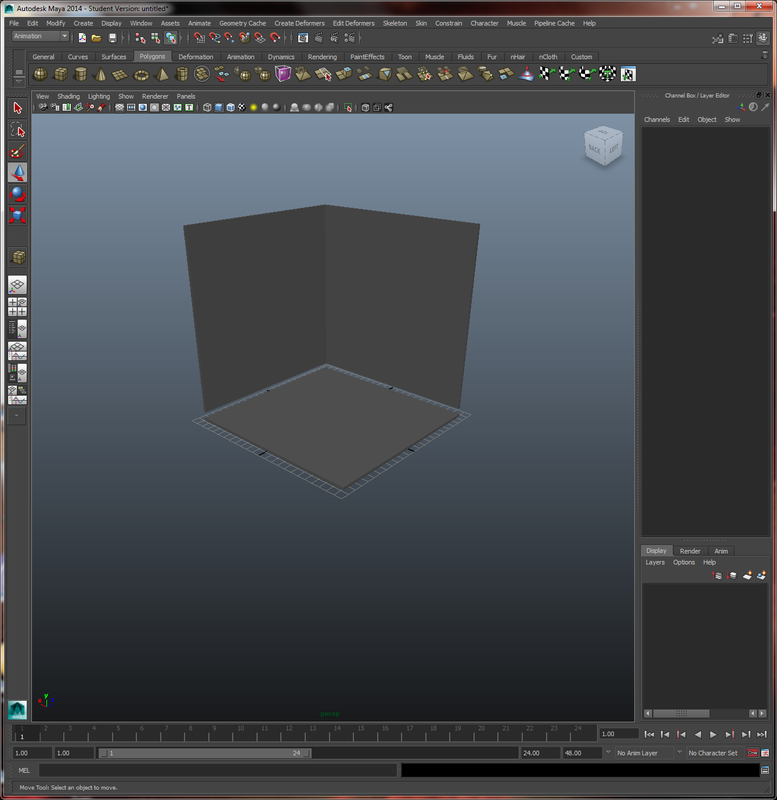 Step Five: In order to get the camera to the position by using the camera view. 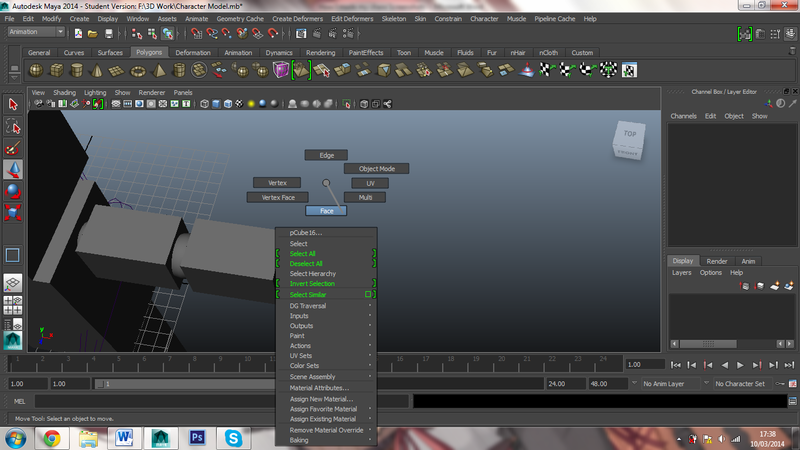 Step Six: I then had to make sure that I had all the settings correct. 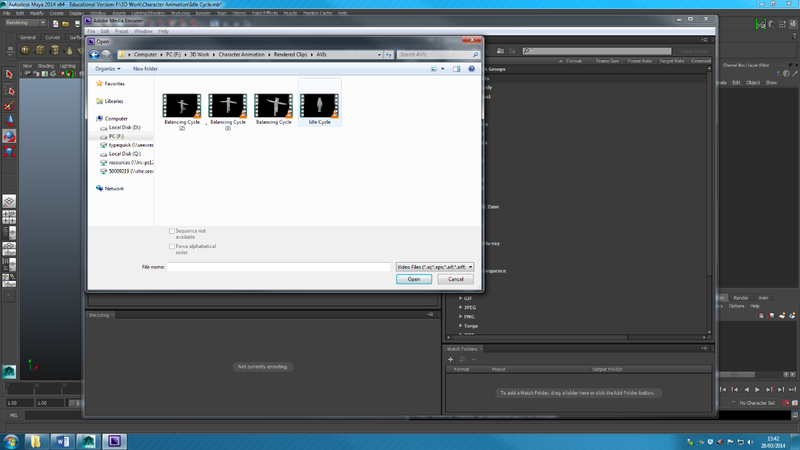 Step Seven: I then used ‘Batch Render’ to render the footage. 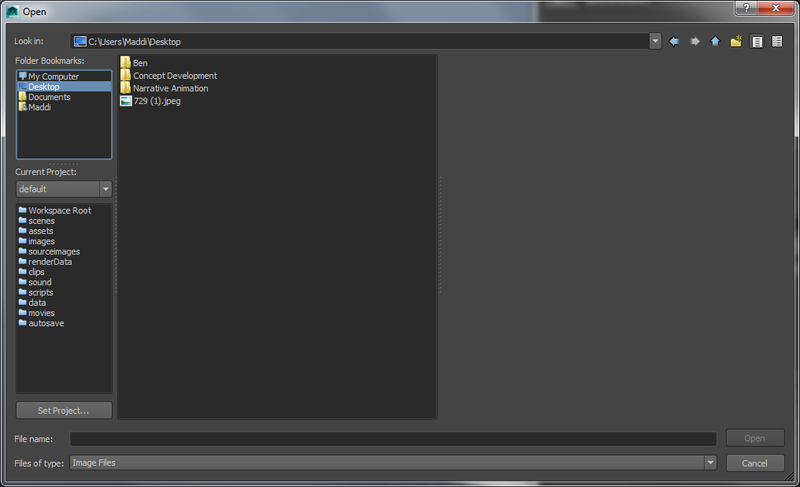 Step Eight: When the files were rendered they were saved as .avi files. 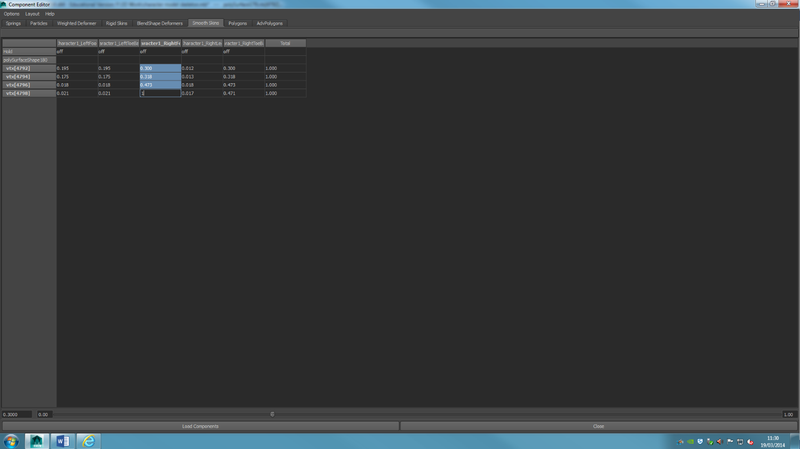 Using Adobe Media Encoder I changed the file type to .mov files so I would be able to use them in Final Cut Pro. 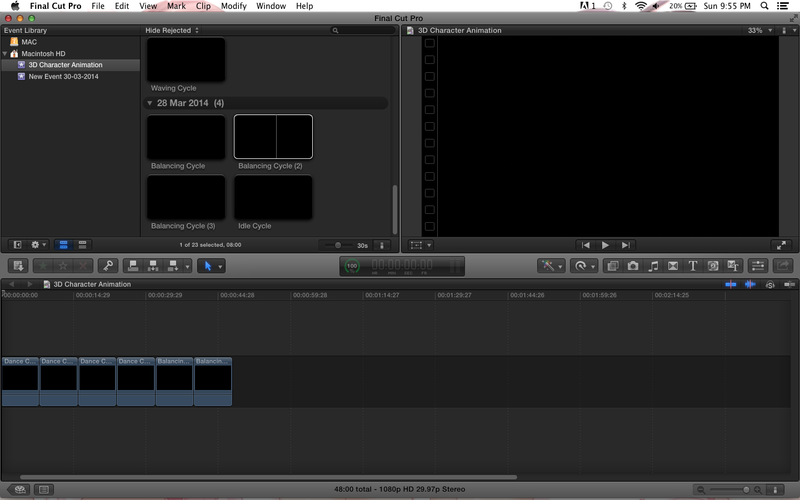 Step Nine: I then had to change to a Mac to use Final Cut Pro. I imported the various .movs and arranged them in order. 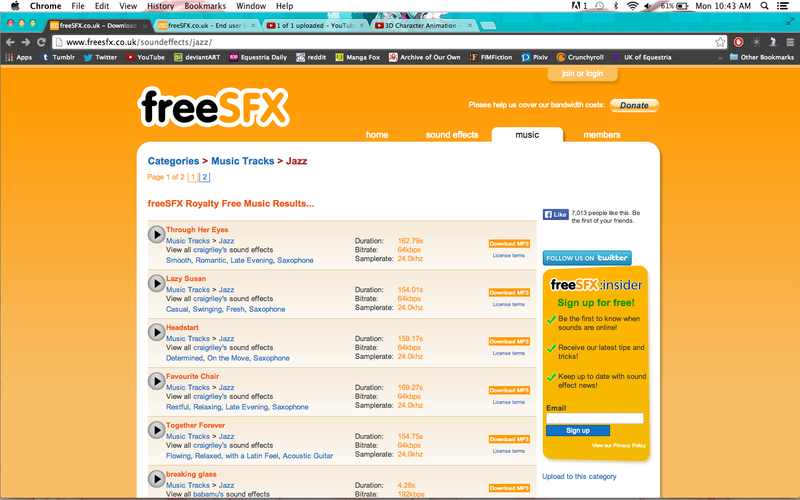 Step Ten: I used a royalty free music site to get some background music before importing it into the animation. 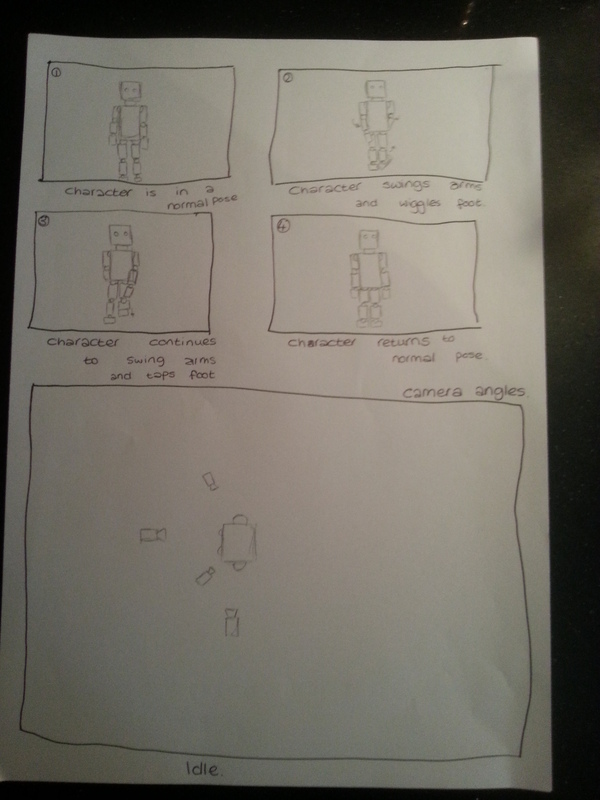 Step Eleven: Finally I uploaded the finished animation to YouTube. 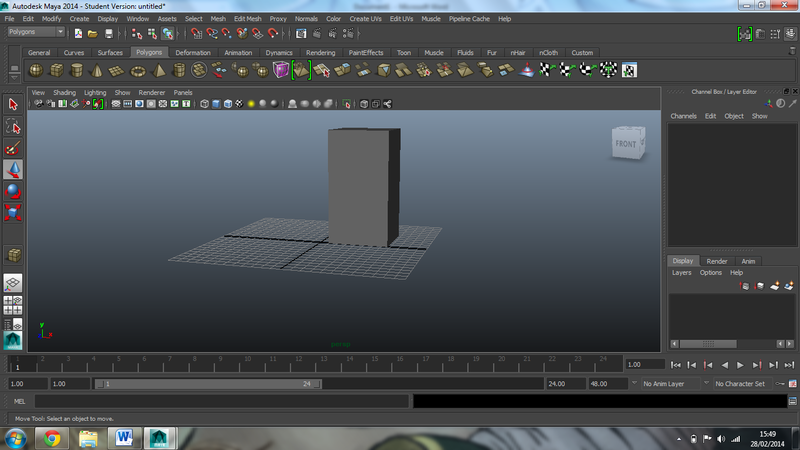 Step One: To start with I created a rectangular cube to be the basis for the body. 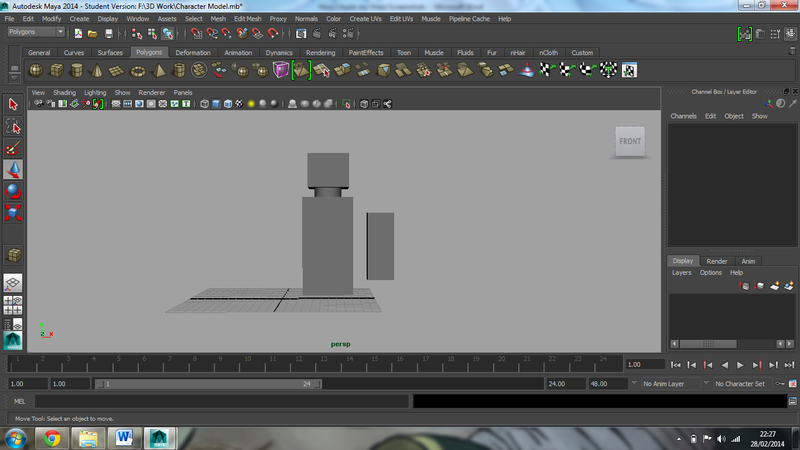 Step Two: I then created a small cylinder for a neck. 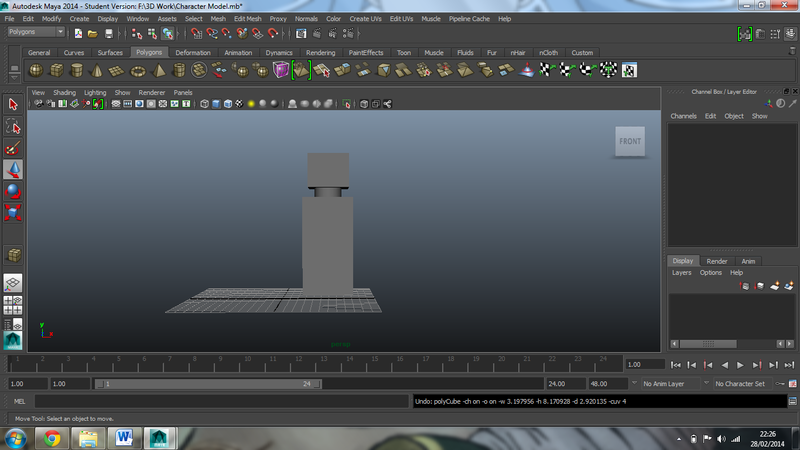 Step Three: I then created a cube for the head and placed it on top of the cylinder. 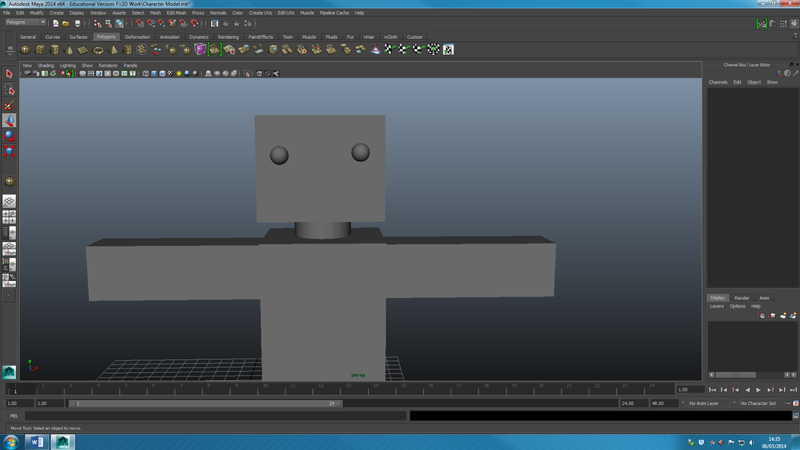 Step Four: I then created an arm using another rectangular cube. 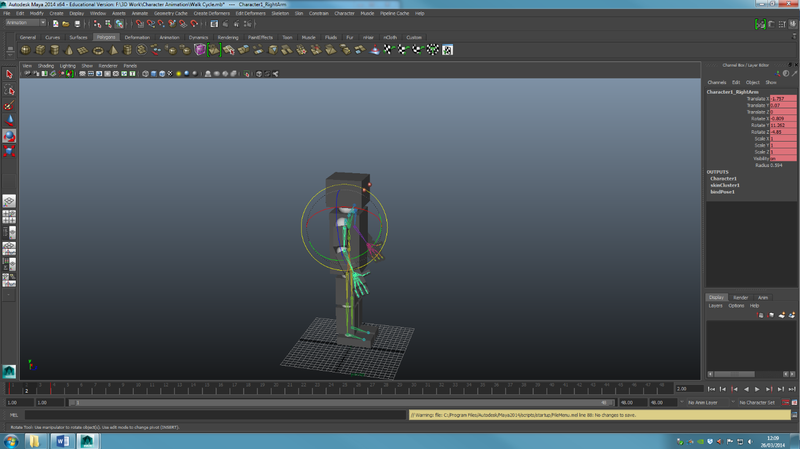 Step Five: I then duplicated the arm and manipulated it to mirror the other side. Step Six: I then created a block for a leg, but saw that it was too large to fit on the body. 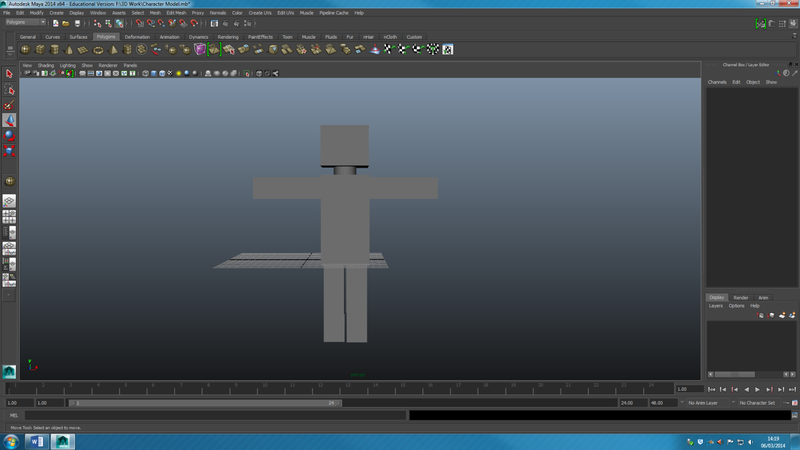 Step Seven: I then edited the body proportions to better accommodate the legs. 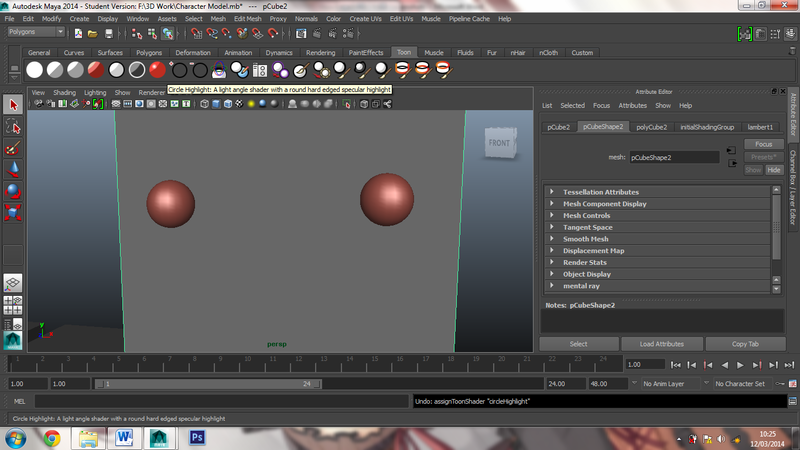 Step Eight: I then created two orbs to be a pair of eyes. 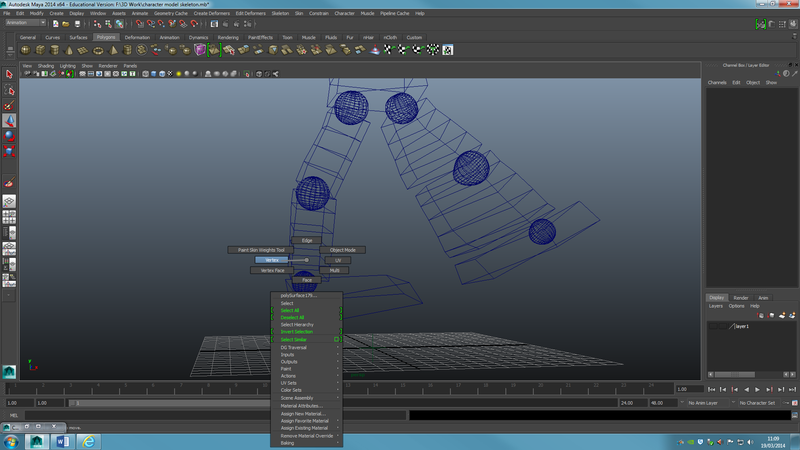 Step Nine: I then realised that for better articulation during animation I would include spheres. 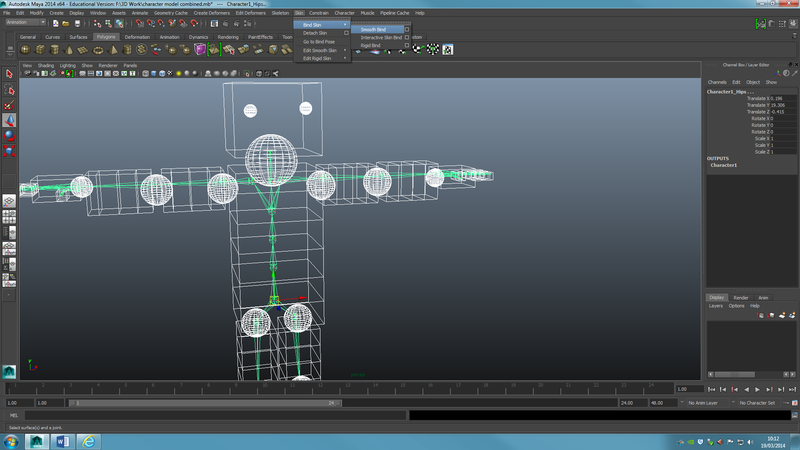 Step Ten: This was my model after adding spheres. 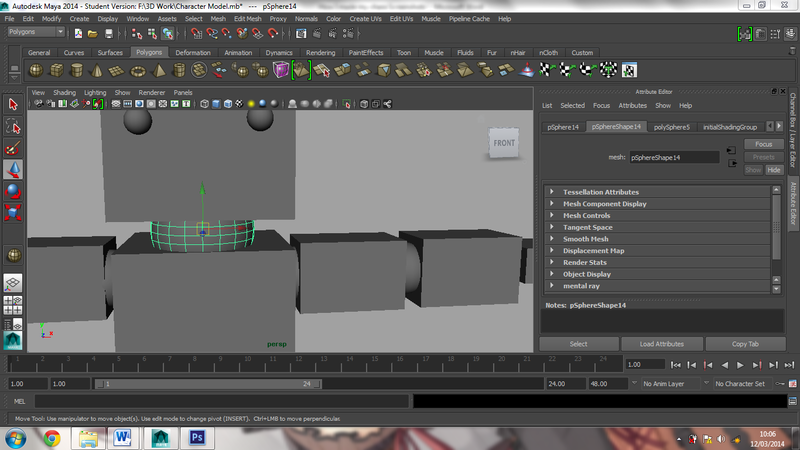 Step Eleven: I then added two spheres and two more blocks for feet. Step Twelve: I began on the fingers by starting with a block and then duplicating it. 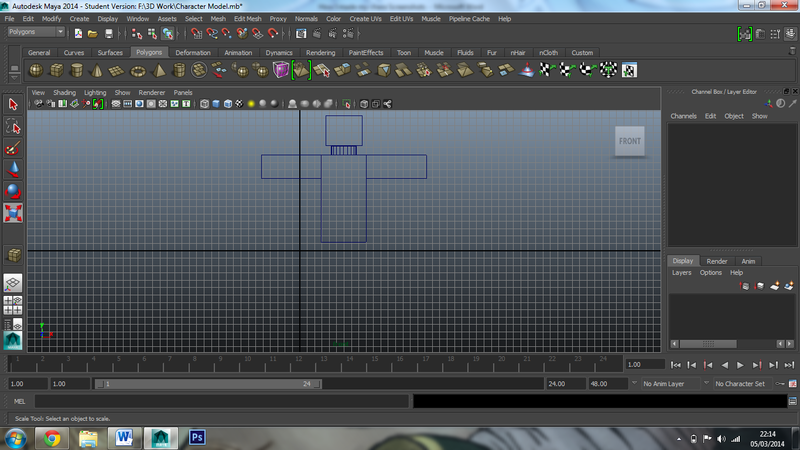 Step Thirteen: Using right click and face I began to extrude the end faces of the fingers. Step Fourteen: I then combined the separate elements of the hand into one and duplicated it to go on the other half. 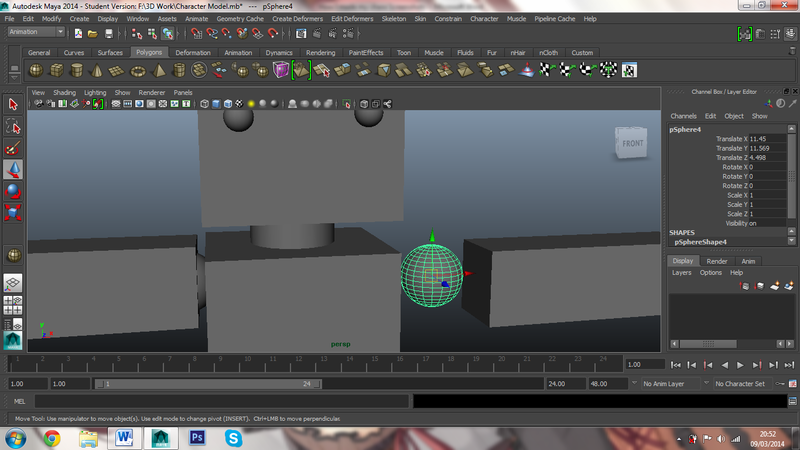 Step Fifteen: I then decided to change the neck to a sphere instead for better mobility. 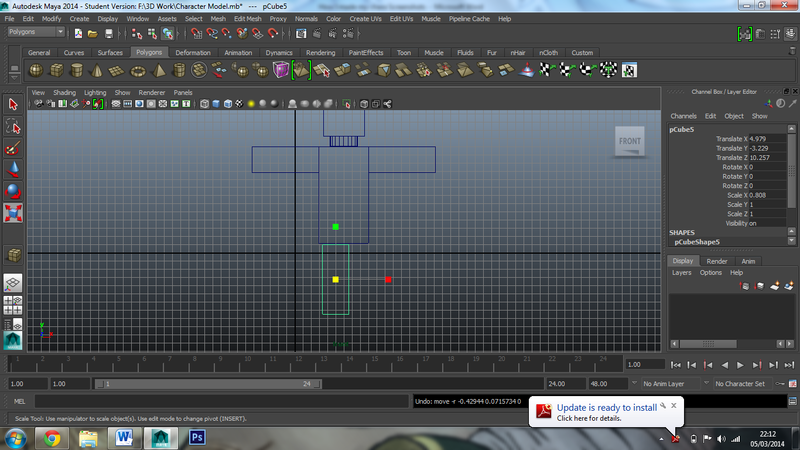 Step Sixteen: I then began to colour my model using the toon tab. 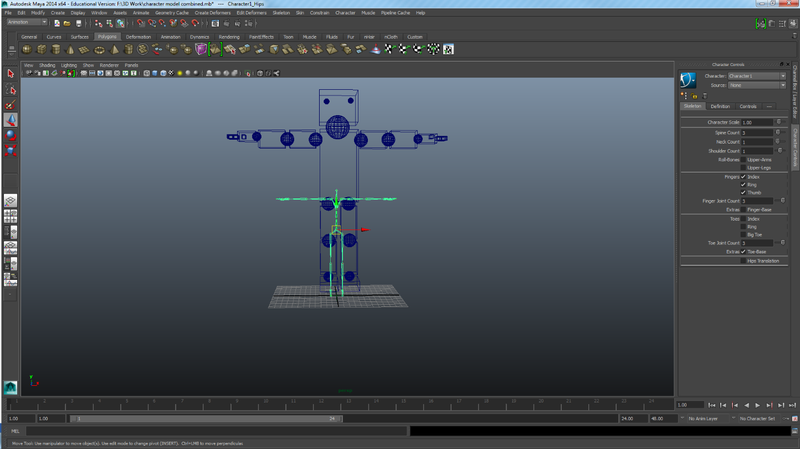 Step Seventeen: Before placing a skeleton inside my model I made sure to combine it together so it will be treated as one object. 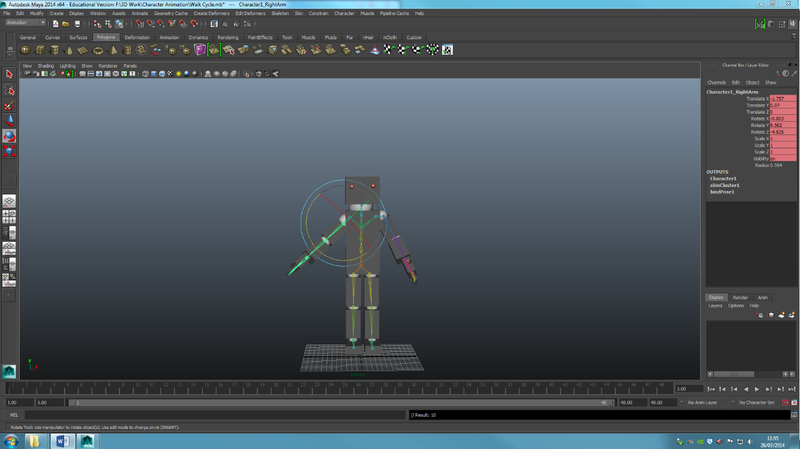 Step Eighteen: I then changed the menu set from polygons to animation and selected HumanIK to start with the rigging. Step Nineteen: I then put in dividers using the edge loop tool. This would help with certain movements and better articulation. 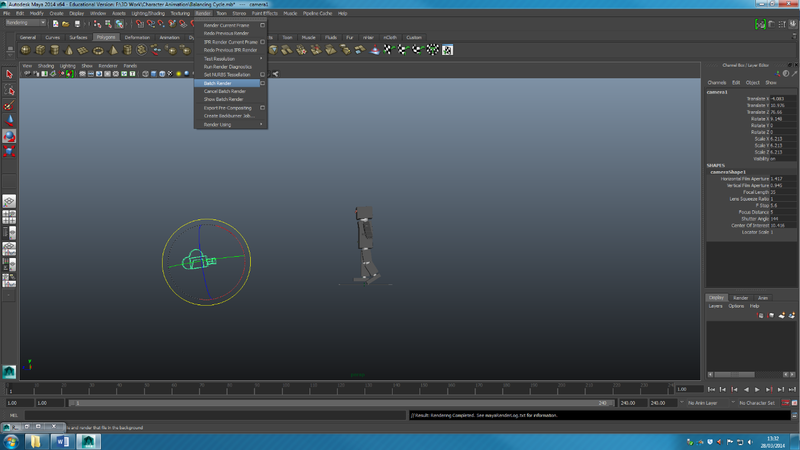 Step Twenty: I then started arranging the skeleton inside the model. I had to make sure that the body in the ‘definition’ tab was green. 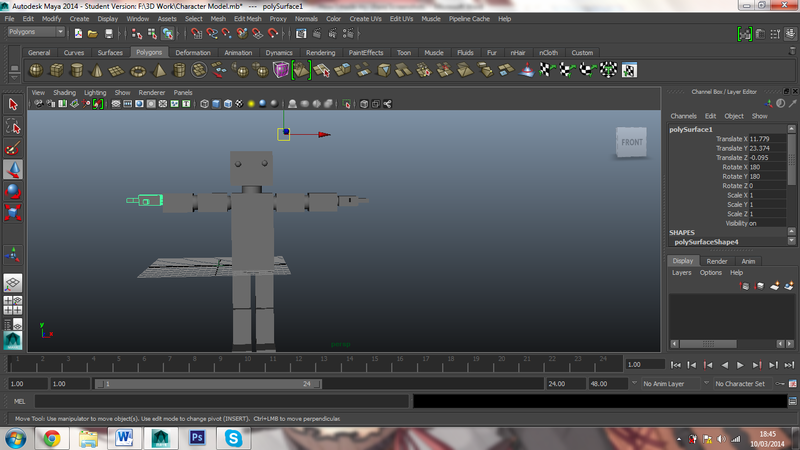 Step Twenty One: I then combined the skeleton to the outer model by using smooth skin tool. 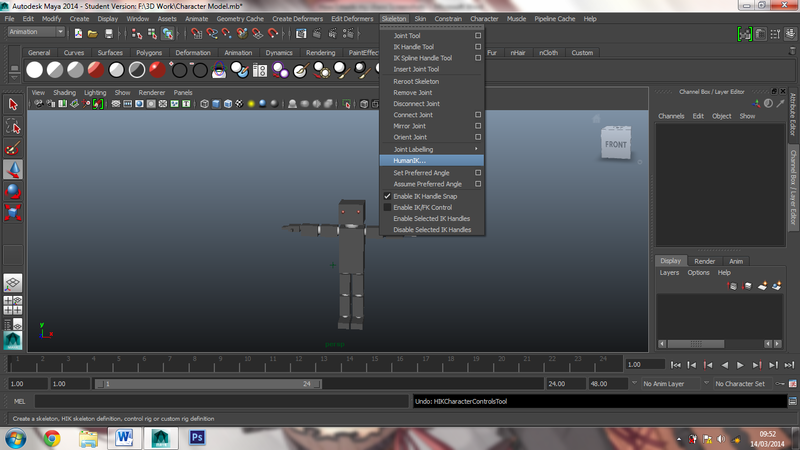 Step Twenty Two: I then made a layer for the skeleton rig and made it unviewable by pressing the V on the layer tab. 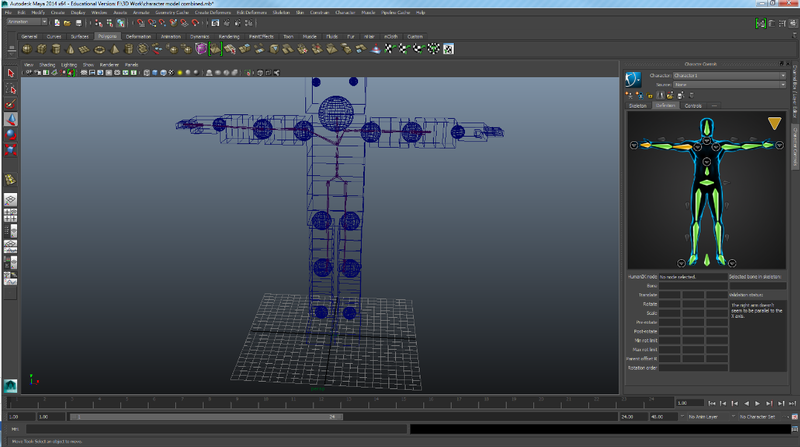 Step Twenty Three: I then went into the vertex mode so I could select certain spots. 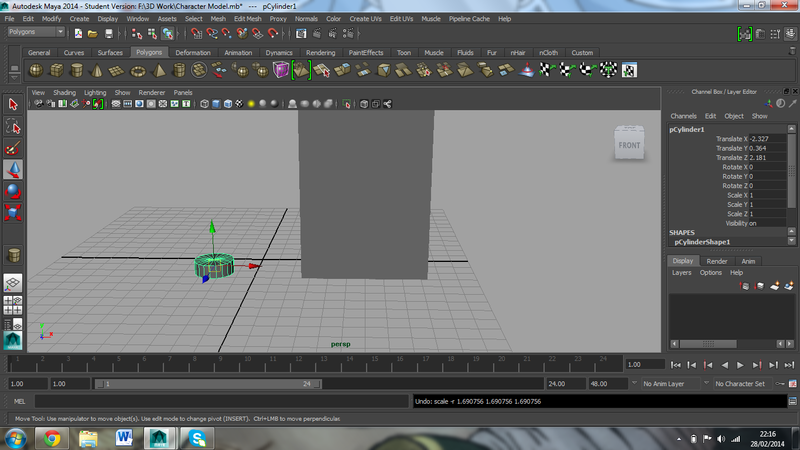 Step Twenty Four: I then changed the different values to 1. 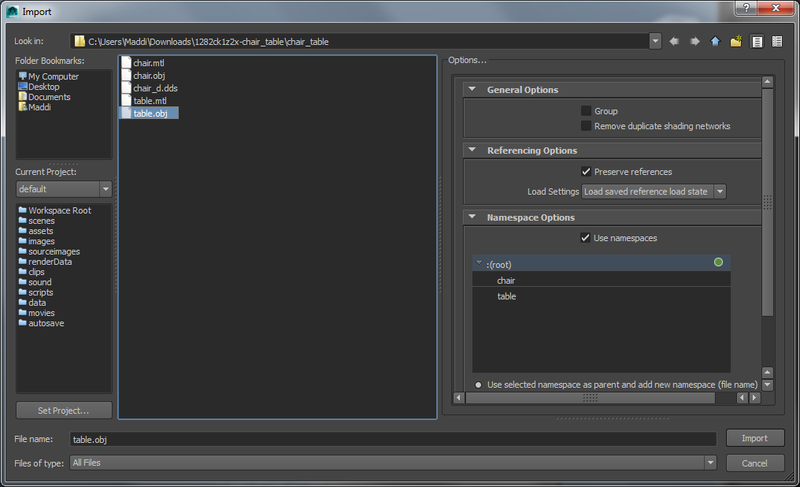 Step Twenty Five: To open the component editor you have to go in the window tab, general editors and then component editor. 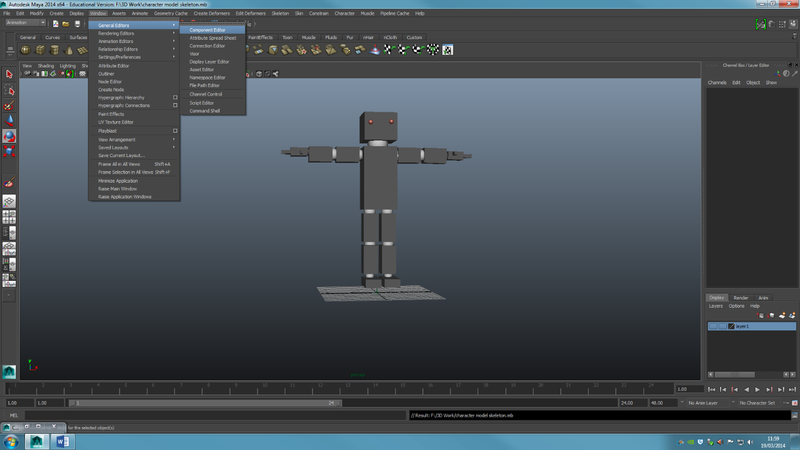 The model was then ready to animate. 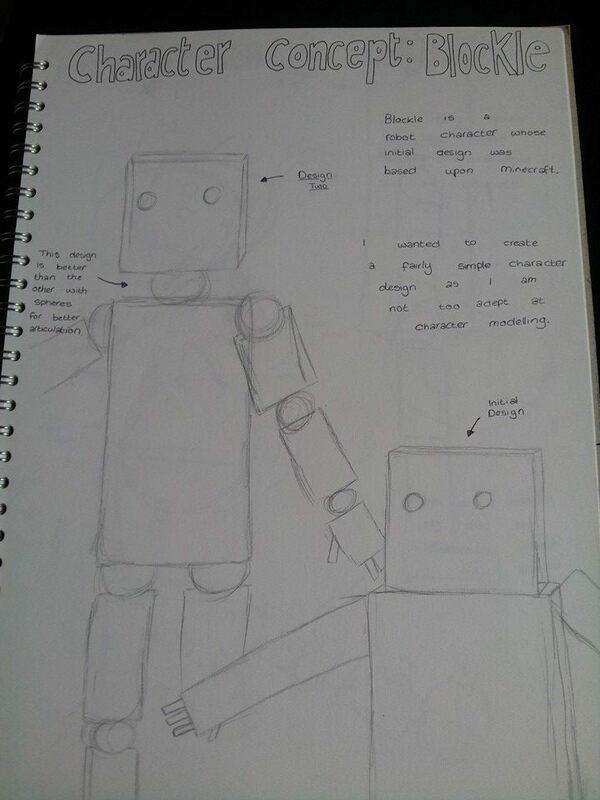 The final character design I got done was Blockle, a robot character that is seen in my final animation. 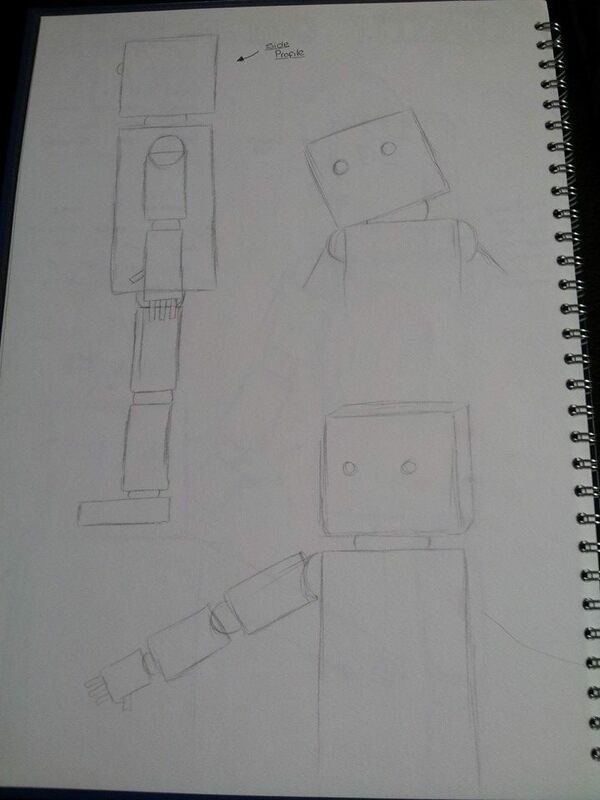 Blockle was initially inspired by the game Minecraft, but was then revised so it would be possible to animate him.